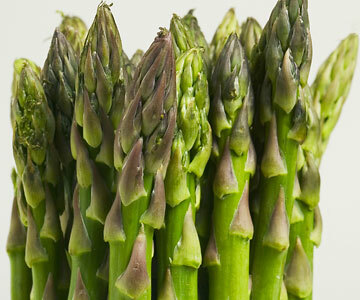 To prepare the asparagus, cut off and discard the woody ends, then neatly cut the tips away from the stalks. Keep the tips and stalks separate. In a small saucepan bring the cream and garlic to the boil. Take off the heat, remove the garlic, then set the pan aside. 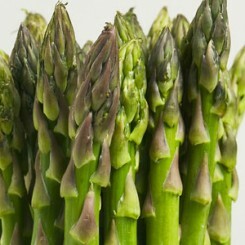 Cook the stalks in boiling salted water for about 4-5 mins until tender, drain, then tip into the cream with the grated parmesan. Blitz with a hand blender until smooth. 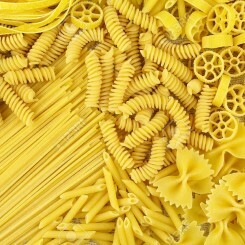 Cook the pasta according to pack instructions, then throw in the tips 2 mins before the end of cooking time. Gently reheat the cream, drain pasta, then tip into a bowl with the cream. 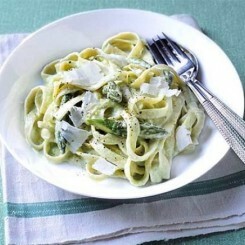 Toss, divide into pasta bowls, top with parmesan shavings and serve.